Eldandil’s Haldan, Eldandil’s Haldan, Eldandil’s Haldan! I apologize again for my lack of updates in the past month. My playgroup has been meeting a little less often now that we’ve completed the saga, though we’ve started progressing through the current cycle, and I’ve started my own solo saga campaign. I really love the early saga quests, and I hope to start doing a series about the saga quests in the near future. The newest adventure pack has made it to my doorstep. This is the first one I’ve received using Team Covenant’s subscription, and I must say I was pleased with the process. I’ve known about their subscriptions for a while, and I’ve always been a fan of their community content and custom wooden tokens, but I’ve only recently taken the plunge on the subscription. This is not a paid advertisement or anything like that, but I do recommend them if you don’t have a local game store that will support the game. I was so excited for Grimbeorn from the last pack, and I’ve been so excited for Thranduil to come out in the next pack, that I hardly gave Haldan a second thought when I first saw him. I started playing around with deck ideas, though, and soon discovered I was wrong to overlook him. I actually think at this point that I probably like him more than Grimbeorn – and I was really looking forward to Grimbeorn. This particular Haldan is a made up character – but Haldan is not a made up name. In the First Age of Middle-earth, Haldan became a lord over the men of Brethil. He was himself the nephew of Haleth, head of the House of Haleth, one of the three houses of the Edain. The men of Brethil were of the people of Haleth and lived in the forest of Brethil on the western border of Doriath. So, they were woodsmen. Our Haldan is obviously not the same character, as our game is set in the Third Age, but the ways in which this character are derived from his First Age counterpart are obvious. One could speculate, then, that this Haldan may be a descendant of the men of Brethil from the First Age, possibly even from that Haldan himself. Perhaps some remnant of the folk of Haleth survived in the woods throughout the ages of Middle-earth. I suppose we’ll know more by the last adventure pack, which should surely include a write-up about the character, mirroring the last adventure packs from the previous few cycles. 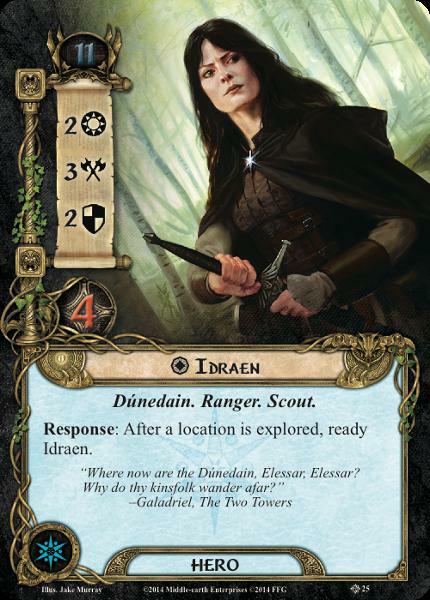 Without further ado, let’s dive into looking at our latest hero card, which I feature in my deck Scouting Party – or, Eldandil’s Haldan deck! It took me some time to realize this, but I believe Haldan works well both as a splashable hero, and as a build-around hero. You could get away with a relatively light mono-lore location attachment package in a deck that otherwise has nothing to do with location attachments and reap some pretty good general benefits: card draw (Haldan and Ancient Mathom), threat reduction (Woodmen’s Clearing), action advantage (Haldan), resource acceleration (Elf-stone). Because there are so many great options for location attachments, however, you can also use Haldan as the focus of a location manipulation deck. Halda’s take on location control is different from what we’ve previously seen. Location control used to refer to progress in the staging area with Northern Tracker, Asfaloth, etc., or the use of Thrór’s Key and Thrór’s Map to bypass travel costs and blank text boxes. Haldan doesn’t fully negate either of those (though Woodmen’s Path doesn’t work well with Northern Tracker), but he opens up a new way of utilizing location control by shifting the focus from the staging area to the active location. Now, you don’t just have to explore locations to get them out of the staging area – you want to explore locations to give you access to other benefits. Locations now serve as resources you can exploit to gain advantages over the encounter deck! 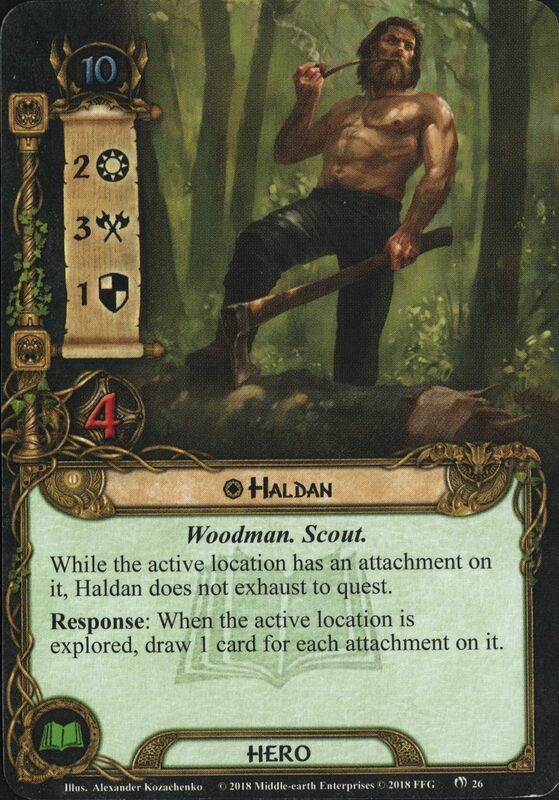 Which, by the way, feels satisfyingly thematic for a “woodmen” or “scout” deck. This realization led me to immediately think about pairing him with Idraen, who gains action advantage when the active location is explored. Since Haldan always wants an active location to explore, you’ll basically get free action advantage out of both heroes almost every turn. I tried out a number of different heroes for the third slot before deciding on Galadriel to round out my lineup. For those who know me (or who just read this blog), I have a big soft spot for Galadriel in this game. She’s probably my favorite hero and easily one of the most splashable in a wide variety of deck archetypes. It’s her versatility that serves our purposes well here. With Nenya in your starting hand, she can quest early and help clear out those active locations. Once you’ve built up a questing team of allies, however, she can switch gears to threat management and card draw, not just for you, but for other players as well. Her access to both lore and spirit resources is really what seals the deal here, though. With Nenya, she can help you get out almost any of your allies each turn, enabling you to build up a solid board state quickly. Spirit Glorfindel was the next best that I found to Galadriel for this lineup. With Light of Valinor, he too gains action advantage, but he’s not able to pay for lore cards without Song of Wisdom, and one of his biggest boons – Asfaloth – doesn’t really fit in with the type of location control deck we’re building. The best attachments here are Ancient Mathom, Elf-stone, and Woodmen’s Clearing. This deck can draw insane amounts of cards. One of your biggest challenges in playing it is going to be determining whether you stack up all of your attachments on a single location to get fast advantages, or whether you spread them out to make the most out of Haldan’s action advantage. For example, last night I was able to attach two Ancient Mathom’s, and Elf-stone, and a Woodmen’s Clearing to a single location on the second turn. By exploring it the same turn, I drew ten cards (three from each Ancient Mathom and four from Haldan’s ability), lowered my threat by three, and dropped a Wandering Ent into play. With that many cards in hand, I was pretty much set for the rest of the game. This deck definitely ratchets up the power level in solo, since Ancient Mathom, Elf-stone, and Woodmen’s Clearing all target the first player. It makes for a good support deck in multiplayer, but you’ll be getting far less of the benefits out of the attachments, which will slow you down a little bit. It’s by no means bad in multiplayer – it’s just strongest in solo. The deck packs a few fun combos to look out for. 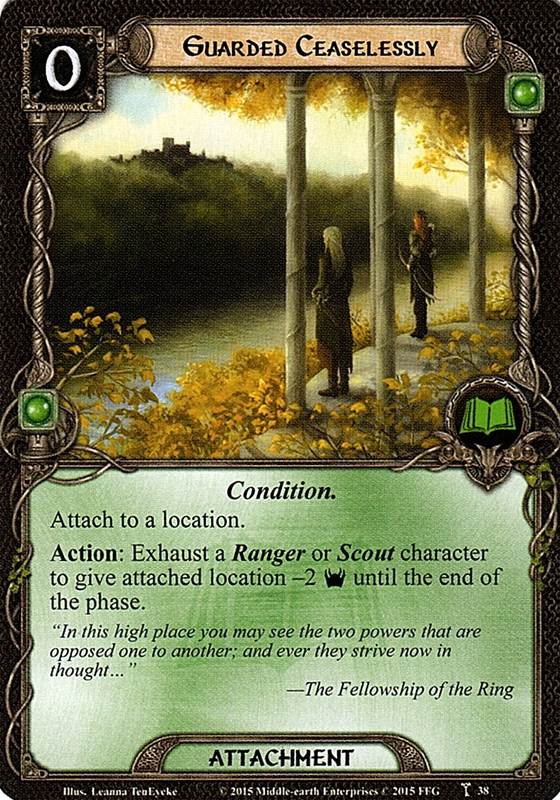 Erebor Hammersmith can get back whichever attachment is top-most in your discard pile. If you time this right, you can keep recurring Woodmen’s Clearing or Ancient Mathom for increased benefit. Guarded Ceaselessly pairs well with Haldan. If it’s attached to a location in the staging area, and the active location has an attachment, Haldan can quest without exhausting. Then, after staging, if you need an extra boost, you can exhaust Haldan to lower the threat on that location in the staging area by two. This effectively allows Haldan to contribute a swing of four to the quest. You want that location to remain in the staging area, however, so I only run two of it in this deck, because multiples are kind of useless. 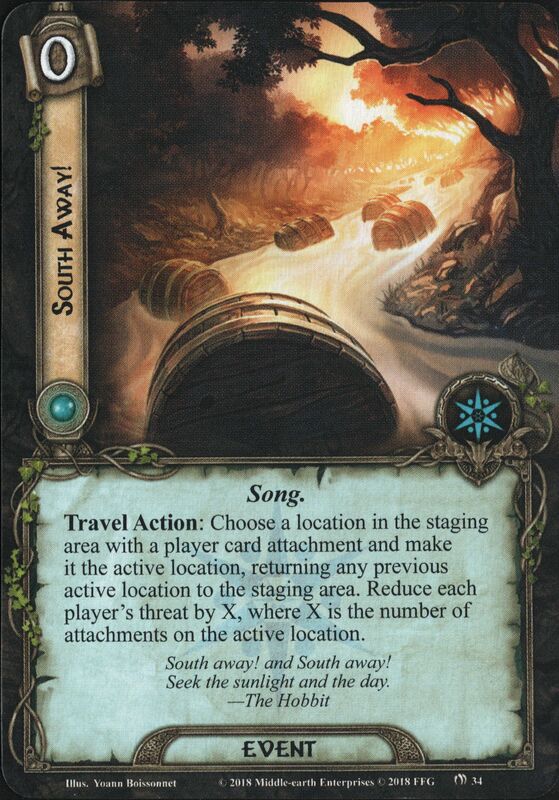 True, they’ll net you a card with Haldan and lend to his action advantage if you travel there, but traveling to and exploring that location is not as helpful as with some of the other attachments. Finally, Woodmen’s Path pairs well with Elf-stone. Elf-stone increases the quest points on the active location, but Woodmen’s Path actually reduces it back down to one. 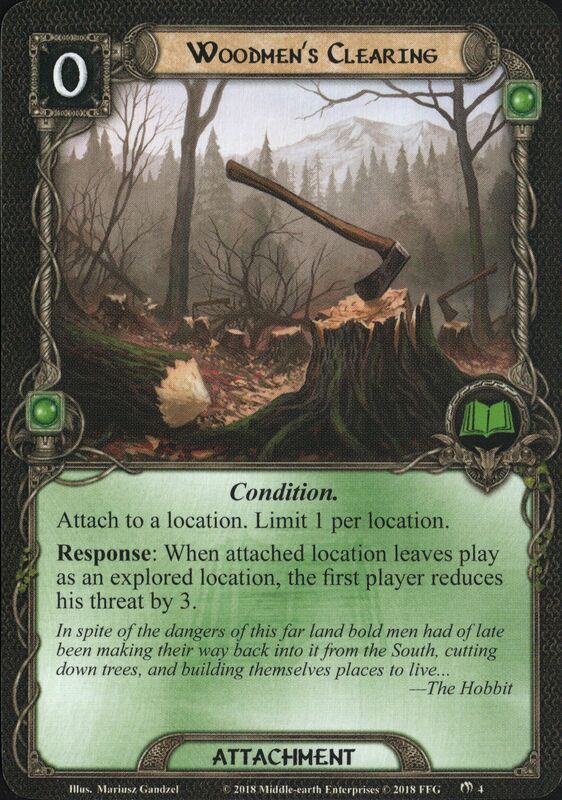 Other than this use, though, Woodmen’s Path seems expensive for what it actually does compared to the other location attachments in this deck, so I only include two copies. South Away! is a good way to avoid travel costs. It also serves as threat reduction, as it’s not difficult to pile up a few attachments on a single location. It’s one card in this deck that actually leans more towards multiplayer than solo, however. Also, while Haldan’s ability does work with encounter card attachments on locations (like guarded objectives), South Away! only works with player card attachments. This deck has two main weaknesses that I’ve identified so far. First, it can struggling in defending attacks. Idraen can probably cover some of the small attacks early. Your real defender here, though, is Treebeard, so you want to try to get him out early. He may be worth a third copy. Alternatively, you could ditch the two Wellinghall Preservers for the Mirror of Galadriel to help you find Treebeard (and your location attachments) more efficiently. I just didn’t include the Mirror here because some of this deck’s events end up staying in your hand for a few turns before they find optimal use, and I didn’t want to risk discarding them. You can also try to avoid enemies, though, by keeping your threat low or by using The Hidden Way to prevent revealing an enemy. The deck’s other main weakness is that it can stall out if there are not many locations. This is more of a problem in solo than in multiplayer, but I haven’t had too much of a problem yet with it. The Dunedain Pathfinders can help you get out locations, as can The Hidden Way. If you time these right, you shouldn’t have too much of a problem. One inclusion I was surprised about liking in this deck is the Eryn Galen Settler. His stats are actually pretty good for his cost, and his ability has been surprisingly useful at times. If there’s an extremely bad location, for example, with either really bad text or a bad travel cost, you can blank it with the Key and leave it in the staging area to rot. If you get a second one, you can’t play a second Key because they’re unique, but you can travel to the one with the Key, explore it, and then discard this ally to discard the other in the staging area. I’ve done this in a couple of quests now to great advantage. It just depends on the board state at the time, but his stats give him a versatility that makes him a pretty worthwhile inclusion. Readers, what do you think of Haldan? How have you been using him? I haven’t seen too many decks pop up on ringsdb yet, so I’m curious to see where he ends up finding a home. Has he been “cracked” yet, or does his true potential remain to be revealed? As always, thanks for reading!